The principles of good corporate governance include, in particular, the elements of adherence to the rules in operational conduct and the protection of employees. In order to make this possible, modern whistleblower systems must be installed which are available to all employees throughout the Rheinmetall Group and also to external parties, so that suspicious events can be reported. 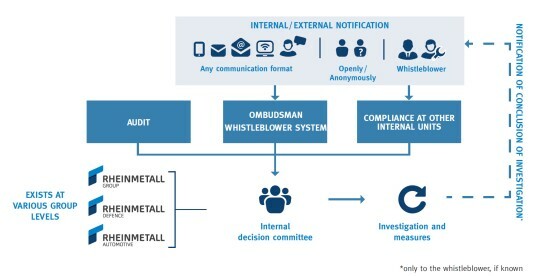 International whistleblower systems are an indispensable pillar of any modern Compliance Management System (CMS). Employees and also external persons such as business partners are thus given the opportunity to report compliance violations without having to reckon with personal sanctions. For this purpose, Rheinmetall has created several ways of reporting a compliance violation. The whistleblower is thus free to choose how he wishes to report his information to Rheinmetall. If there is any suspicion of criminal offences or serious irregularities detrimental to the company, anyone at Rheinmetall can confidentially contact either the ombudsman (lawyer of confidence) or Corporate Compliance. Learn more about the possibility of reporting to the Ombudsman (external contact). Find out more about the possibility of reporting to the Corporate Compliance Department (internal contact persons).